Note: Like the rest of the world, Golf Tips is all about the Masters this week. 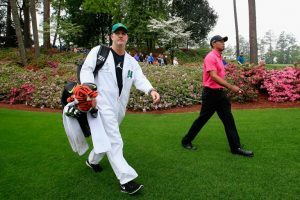 Editor Vic Williams will chime in each day with his thoughts on the world’s greatest golf tournament, starting with some Masters memories of his own. As the week plays out and the competition heats up, follow us on Twitter @golftipsmag and on Facebook at Golf Tips Magazine. If all the world’s a stage and life is but a poor player whose shadow struts and frets for an hour upon it and is heard no more, then we golfers, in particular, are fortunate enough to do our strutting and fretting on some damned fine stages now and then before we shuffle off our mortal coils (forgive me, Wild Will Shakespeare, for the soliloquy mashup). On a fine spring afternoon, even that back-of-the-hand-familiar muni down the street can find itself dressed up in a Tony-worthy costume, stitched with sunlight and draped over the earth in perfectly tailored harmony. Yet, as with so many things in life, there’s that golf stage we’ll most likely never tread, instead admiring it from the sidelines and memorizing its every dimension, the way the light splashes across it in just the right way from scene to scene … or hole to hole. Augusta National is golf’s ultimate stage of dreams. We know it as well as we know our own names, mostly through year after year of savoring The Masters from our living rooms. Folks who have stepped foot on its manicured flanks and watched the “toonamint” in person come away forever changed. Believe it or not, I have yet to be one of those people. And I call myself a golf writer. Maybe one year I’ll remedy that (I say that every year). But for now, Augusta comes to me in big screen bounty. That screen was much smaller 44 years ago, the first year that I tuned in and actually paid attention to the Masters. 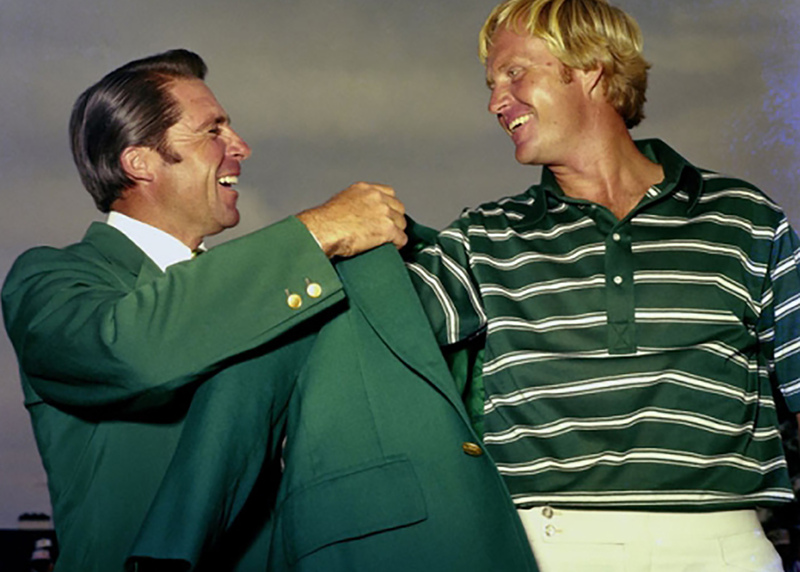 I’d been a Jack Nicklaus fan since I first picked up a club at age 12 in 1972, when the Bear won his fourth of six green jackets, but it wasn’t until 1975, when he buried that famous uphiller on No. 16 to outlast Tom Weiskopf and Johnny Miller and cement his fifth (“I’ve never seen such a putt in my life,” said Henry Longhurst), that I became truly and completely hooked on the Masters mystique. I don’t think I’ve missed a year since, and as with so many sporting events its every occurrence accompanies milestones in my life. When Jack notched No. 6 at age 46 in 1986, I was married with my first kid on the way. By the time Greg Norman melted down in the face of Nick Faldo’s 67 in 1996, I had remarried and was getting ready to move into the house where we still live. A year later, when Tiger Woods shook the professional golf world for the first time, I had just become a father for the third time. And so on through the subsequent two decades. Tiger racking up three more. Phil with three of his own within a seven-year span. 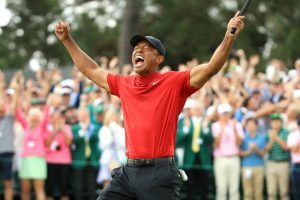 Rory’s final round collapse, Jordan Spieth’s triumph and tragedy, Adam Scott’s scream of wild relief in the rain: Who among us can’t spout off our own litanies of Masters memories that, when we come right down to it, encapsulate our passion for the game, which we then carry into blissful battle as the golf season sprouts anew for another season? We learn a few things through that passion, too. Through my competitive high school years I tried to emulate Nicklaus’s piston-like putting stroke with less than limited success, though I still do my best to channel his inimitable powers of focus and fearlessness when my addled senses allow, coupled with mental images of Ben Crenshaw employing his own buttery stroke on those slick and treacherous Alister Mackenzie greens. I’m sure I’m not alone in holding up Tiger’s Augusta-honed short game acumen as a worthy goal every time we give that old wedge the practice attention it deserves, or strive to tap into Faldo’s rapier-sharp iron play when faced with a testy sidehill lie as our two-buck-betting buddies look on. And on what other American layout than Augusta does our ever-strong desire to blast that tee ball far and true go on gorgeous and impossibly green-against-blue display, if only vicariously through the sculpted swings of Scott, Rory and Dustin? No doubt Golf Tips’ Top 25 instructors can name any number of lessons they’ve learned by immersing themselves in the event each year, then developing their own Masters memories and turning them into useful lessons for their own students. Somehow it brings out the best (and sometimes the worst) in the game’s top names, and there always seems to be one salient stroke — a spot-on tee shot, a brilliant recovery from the pine straw, a holed chip, a snaking downhiller from one of those dastardly putting surface knolls — that pretty much sums up how to master that part of the game. But perhaps above all, and more eloquently and excitingly than any other event in golf, the Masters teaches us to embrace the unexpected as each round plays out, to never give up, to never concede victory — over our own faults and frailties, if not the rest of the field. Nicklaus certainly didn’t, nor did any other champion hoisting that trophy on the 18th green, or near-champion, or cut-misser. They battled to the final stroke. They know their time to strut and fret is short, and so is ours, so let’s share the Masters magic yet again, and carry it through spring and into our own summertime dreams.